Are We Witnessing The Beginning Of The End For Free Music Streaming? : The Record Spotify has long evangelized free listening as a way to pull users in to paying for its service. The music industry's patience with the strategy seems to have run out. 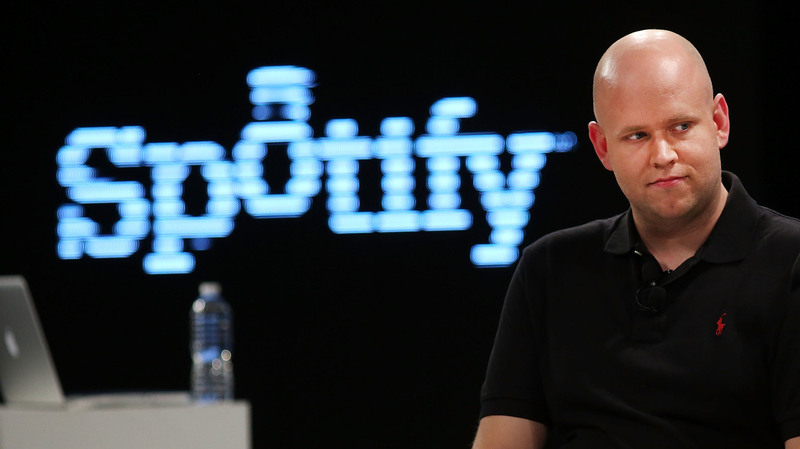 Spotify co-founder and CEO Daniel Ek in 2012, just one year after the service launched in the U.S. It now has 50 million paying subscribers. "Our theory was simple," wrote Daniel Ek, co-founder and CEO of Spotify, in 2014, "offer a terrific free tier, supported by advertising, as a starting point to attract fans and get them in the door." So what happens after everybody's crossed the threshold? At the time Ek wrote that post he was reacting to the high-visibility exit of Taylor Swift from his platform over a disagreement (to put it kindly) about the vast catalog of "free" (what the industry refers to as "ad-supported") streaming music it offered. At the time, Spotify had 12.5 million paying users and 37.5 million listening for free — it now has 50 million subscribers and at least 50 million free listeners. Through that growth, the company has vehemently (and in that blog post from Ek, quite dramatically) defended its two-tier "freemium" approach — free streaming with ads and paid subscriptions with no ads — despite repeated criticism from artists over the much lower royalty rates it paid for those ad-supported streams. No longer. This week, Spotify relented, agreeing to withhold certain albums from the free tier of listeners. For a two-week window following their release dates, certain albums will only be available to paying subscribers. The deal was struck after a two-year-long negotiation with Universal Music, the world's largest record label, over the structure and cost of licensing the label's music. "We know that not every album by every artist should be released the same way," Ek wrote, surprisingly matter-of-fact, yesterday. Billboard reports that in return, Spotify got UMG to agree to lower royalty fees for hitting revenue targets. "In a market this dynamic," Universal Music chairman and CEO Lucian Grainge wrote* of the deal yesterday (Apr. 4), "one evolving more rapidly than ever before, success requires creative and continual re-evaluation of how best to bring artists' music to fans." A key element of the dynamism that Grainge seems to be referencing here is the fact that, unlike at the time of Ek's blog post, a huge number of listeners are now "in the door." Streaming is both the dominant source of revenue for the major labels ("streaming represents the majority of the business," as Grainge wrote yesterday) and the primary way the western world accesses music. The industry is no longer as willing to subsidize Spotify's growth (which has translated into its own success). And so we come to the death, by natural market causes, of a favorite Silicon Valley business strategy. "Interactive streaming services do not need to be 'protected.'" What Apple is referring to is Spotify's own arguments to the Board, in which the company spends a significant amount of time defending free listening. Apple posits that Spotify's arguments to save its free tier amount to institutional protection. To that end, it has proposed a royalty rate that would, if accepted, essentially force Spotify to shutter its free tier, by making it pay the same royalty on paid and free streams. Songwriters have done essentially the same, asking for a raise and a similar change to the structure of their royalties from streaming services. Now that the traditional music business, made up of the major labels and major publishers, has some semblance of stability after a decade-and-a-half of economic diminution and strategic chaos, it's back on the offensive. Killing free streaming is one fight. Spreading its bets through licensing to virtual reality endeavors and being more open-minded to licensing its catalog to social startups — as we covered in early February — is another. Listeners, musicians and tech companies are through the door now. Spotify, an extremely important source of revenue for the music industry, now has to worry about the next milestone — going public. (A report from The Wall Street Journal today says the company may pursue a type of initial offering that could be more lucrative for its equity holders, which include the three major record labels.) After years of the industry softly subsidizing Spotify's growth into a mature business, they now want it to start acting like one.